Ashley’s love of dogs began at an early age growing up with two German Shepherd dogs in her family’s household in the Northern Virginia area. Ashley’s passion for training and creating a solid bond between handler and dog was sparked at an early age. Living next door to a k-9 officer, watching officer and dog work together, gave her insight into the amazing attributes of a dog and an understanding of what a dog is capable of. After finishing college at George Mason University, Ashley joined the corporate world and found success as a pharmaceutical sales representative in the Charlotte area, where she also began working with her personal dog in the sport of Schutzhund as a hobby. She found that she was learning as much from her dog as the dog was learning from her. The true passion for helping others find this same happiness and stress-free way of living with a dog began then and there. In 2008, Ashley decided to turn her love of training from hobby into a full-time career. She began working at a large training facility and kennel, training all breeds of all ages in obedience. She also learned the fundamentals of agility, scent detection, service work, and protection. 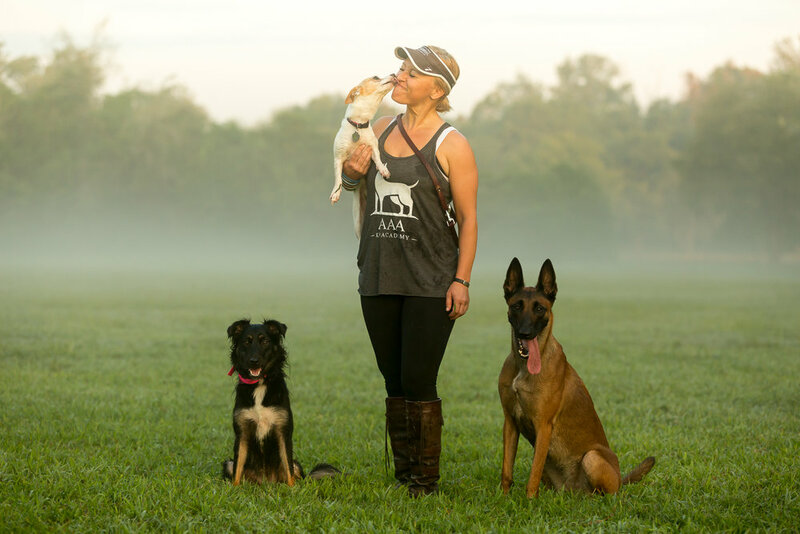 Most recently she worked with an internationally ranked champion dog trainer, training and placing specialized protection dogs with top clientele all over the world. She has worked with dogs of all temperaments and sizes and enjoys tailoring her training to each dog’s individual personality and ability. Having a happy and obedient pet as part of your family makes for a happy home! Contact us today for your free consultation in the Mobile/Eastern Shore area.